Did you know that tie-dying has been around for centuries? Though many think it was invented by American hippies during the 1960s, traditional methods of tie-dye can be found in Japan, Africa, Latin America, and India– and some date back thousands of years! When you’re trying to decide how you want to color your tie dye shirts this summer, consider trying out some of these traditional tie dying methods. Bandhani dye image from Wikipedia. Bandhani is a traditional form of tie and dye still practiced in India today. According to Wikipedia, it became a practice about 5,000 years ago. 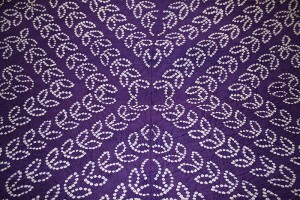 Bandhani involves sewing or tying fabric many times with thin thread and dipping the fabric in dye. HOW TO DO IT: Get a needle and thread. Ball up a small amount of fabric, and sew it shut tight. Repeat as many times as you want, sewing and tying off the dots in the design of your choice. This is a difficult and time-consuming technique, so practice first on something small, like a handkerchief or a scrap of fabric. 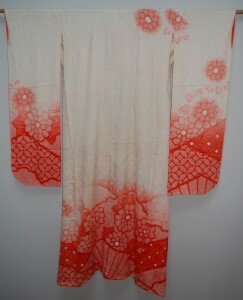 Shibori Kimono from A Daily Dose of Fiber blog. Shabori is a Japanese method of dyeing that has examples dating back to the 8th century. There are a number of different styles of shibori tie dyeing, including binding sections, looping using a hooked needle, pleating and binding, stitching, pole-wrapping, shaped-resisting, and more. 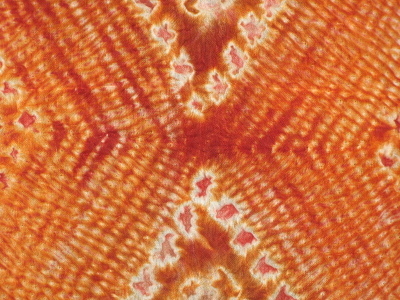 HOW TO DO IT: There are a number of great shibori methods online. 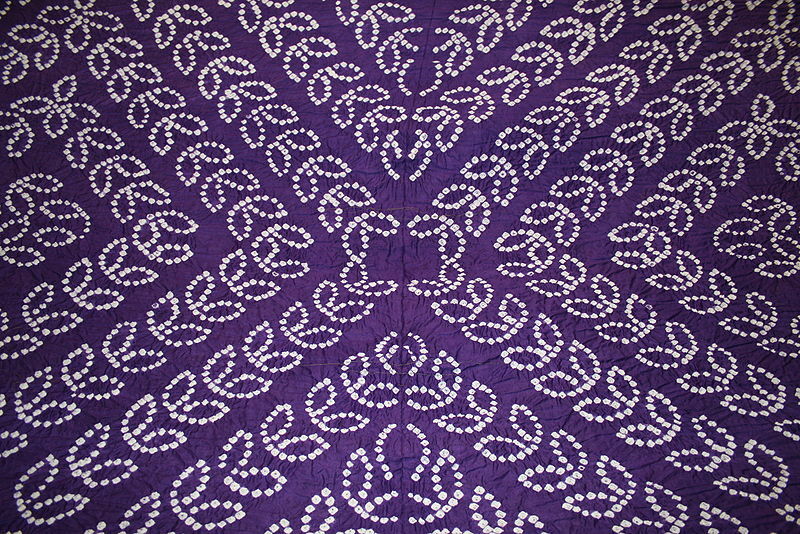 Our favorite extensive guide to shibori can be found on Honestlywtf.com. The two methods we liked the look of the most were the shape-resisting technique, where the fabric is bound around found and irregular shaped objects like stones, and then dyed. The pole-wrapping technique also creates compelling patterns, and is achieved by wrapping the cloth diagonally around a pole and then binding tightly with thread or wire. Mudmee Tie Dye image from Wikipedia. 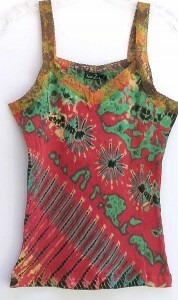 One of the most beautiful forms of tie dyeing, mudmee is a technique originating in Thailand and Laos. The base color for mudmee dyeing is black, and secret techniques are used to create incredible and ornate patterns. Though few know how to do this technique, efforts are being made to preserve the method. African dyed fabric from Barakah Life Handmade. The traditional form of tie dye most closely resembling what Americans wear today is found in western Africa, specifically in Nigeria. The fabric is tightly pleated or wrapped before being dyed multiple different colors. The resulting patterns are close to the psychedelic tie-dye that took the nation by storm after rock stars and hippies began wearing tie-dyed clothing in the 1960s. If you’re looking for a comprehensive article on fun and easy tie dyeing techniques, be sure you check out our resources section for tutorials and how to’s when it comes to making your dye patterns pop!